Author: Block, Valerie Set In . . . 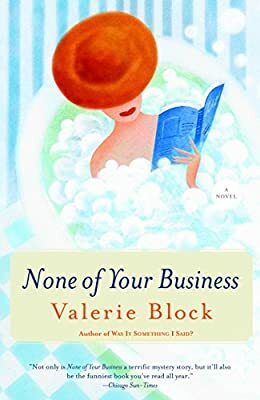 Description: With a nod to Ed McBain and Fay Weldon, author Valerie Block creates a hilarious tale of a heist gone wrong that ranges from the living rooms of Park Avenue to the parking lot of the White Castle on Queens Boulevard. Mitch Greiff, celebrity tax accountant and partner in a prestigious Manhattan firm, hates foreign food, strange hotel rooms, and unfamiliarity. He has nightmares about learning new computer software. So when he disappears after a series of sophisticated wire transfers that siphon millions of dollars from his clients’ accounts, Mitch’s partners and estranged wife, Patricia, are completely astonished and confused. As Sprague investigates, he becomes convinced that Mitch Greiff must have had an accomplice. Sprague works on the assumption that there’s always a girl in the picture. He looks into Patricia, but Mitch’s long-suffering wife never even called Missing Persons, because she didn’t miss him. So Sprague sniffs around the office eye-candy, Heather Perkins, whose signature is on all the wire transfer approvals, and who has a reputation for keeping company with the partners after hours. And then there’s Erica King, Mitch’s “loophole rabbi.” Sharp, dry, and meticulous, she makes up in financial acumen what she lacks in social graces. The collective assumption around the office is that the acid tongue, floor-length skirts, and dingy white tennis shoes mean that Erica is a virgin and will die that way. But Detective Sprague suspects that there is something more to Erica King than the plainest Jane in Manhattan. From elegant Park Avenue matrons to nasty asthmatic forgers in Queens, Valerie Block has created a unique cast of characters. She combines a hilarious comedy of manners with a police procedural and strikes fiction gold.